THINK ABOUT THE ANTI-CHRIST AND HOW HE WILL BE ABLE TO UTILIZE THIS TECHNOLOGY WITH LYING SIGNS AND WONDERS! 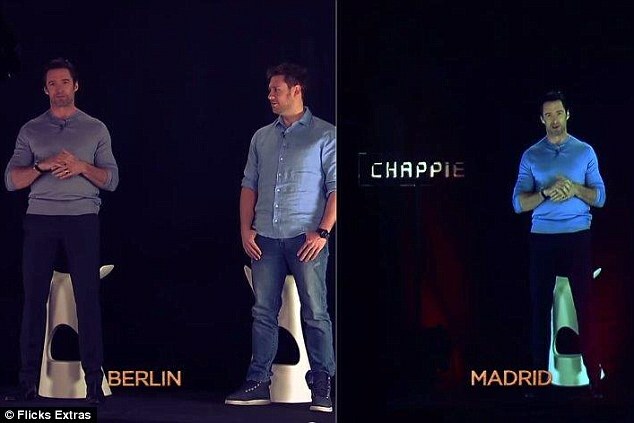 He’s promoting Chappie, a flick about the first robot with human emotions. 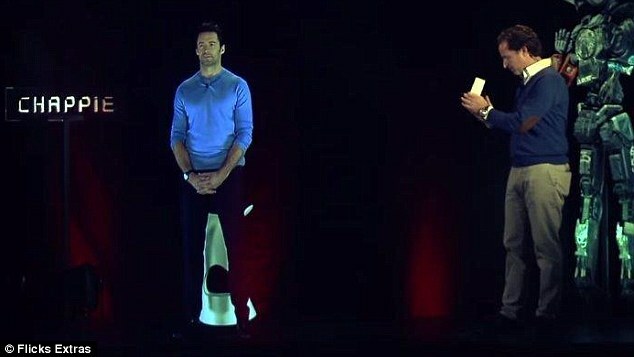 And in keeping with the sci-fi vibe, Hugh Jackman is proving that the future really is now. 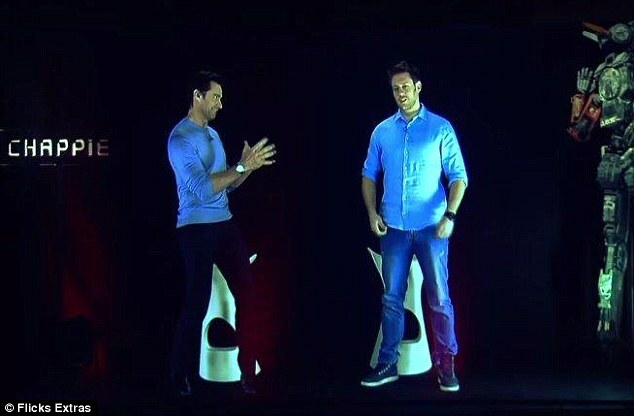 The 46-year-old made history on Saturday while in Berlin, taking part in cinema’s first holographic press conference, as he and director Neill Blomkamp were projected from Germany to Spain’s Madrid. Wearing a long sleeved grey top, black trousers and boots, Hugh took a seat in a Berlin studio alongside Neill, famous for his directing District 9 and Elysium. 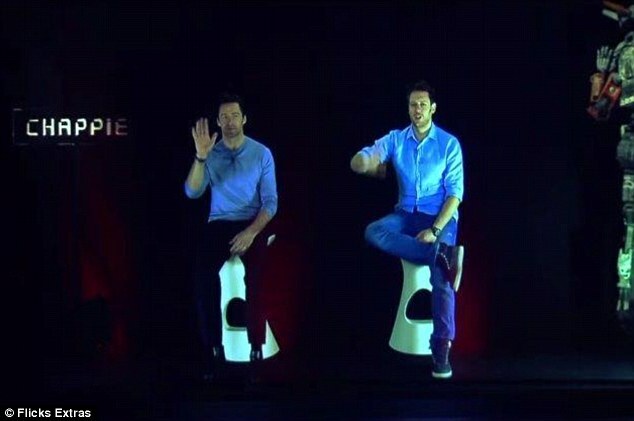 An audience in Madrid were then amazed to see Hugh beamed in, clapping in amazement at the 3D hologram of the Wolverine star. Hugh plays villainous character Vincent Moore, who hopes to destroy Chappie out of fear of new technology. ‘I loved the way that Neill has given a traditional, out-and-out villainous role a very valid argument against artificial intelligence’ he said at the conference, according to Variety. 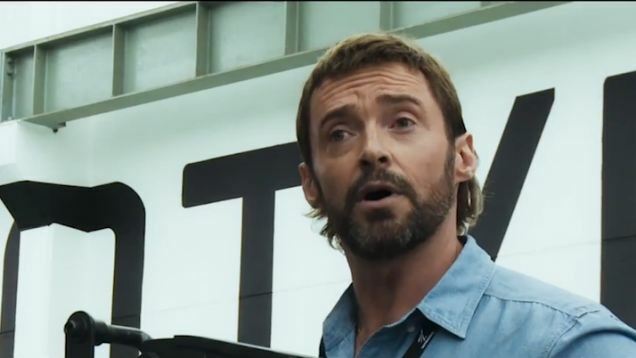 Hugh spent much of February in Europe promoting the flick, touring through the UK, France and Germany ahead of Chappie’s March release. His most recent public appearance was on Sunday at a photocall in Moscow alongside co-stars Sigourney Weaver and Dev Patel. On Monday he shared a shot to Instagram of himself toasting to the good life in a luxurious jet, noting that he was on his way back to the US. Is America the new Roman Empire just awaiting its fall?